Okay guys! 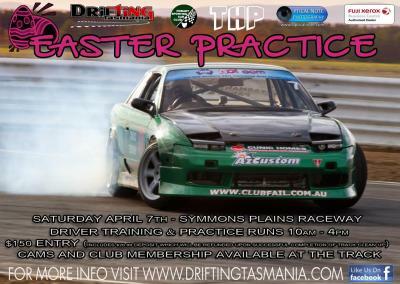 So you all know the drill, April 7th, Symmons Drift practice! This is the perfect opportunity to get on the track before our first round at Symmons ADGP. It's also the ONLY Symmons Practice day for the year, so nut up and come out with us for the day! Everyone welcome! Cost is $150.00 please note this includes a $20 deposit which will be refunded upon completion of cleaning the track Entry form has been attached, along with the supp regs and the flyer. Driver training aswell as practice will be happening from 10am - 4pm. Club membership and CAM's forms will also be avaliable on the day if you're new or requiring renewal. Also guys and girls remember the pits bays are $50 to hire for the day with a $25 refund at the end of the day once they have been cleaned out and this is through the caretaker. please remember if you do hire one to take note of your neighbour and remind them as well as yourself to clean them at the end of the day as we will get charged if MST have to clean anything up rubbish or oils!